San Luis Gandia, Hotel Spain. Limited Time Offer! San Luis. "San Luis" is a hotel that has acquired 3 stars. It is perfect for discovering Gandía. From the residence, it is possible to visit the coast, which lies close-by. A total of 76 rooms is featured. The temperature is never uncomfortable thanks to the air conditioning. The accommodation offers the luxury of an outdoor pool. Visitors are offered the opportunity of practicing golf. You have the option to offer yourself a massage treatment. Taste the international and Mediterranean specialties of the onsite restaurant. For a drink in the evening, visitors can take a seat at the lounge bar. Of course, Internet access is available free of charge. 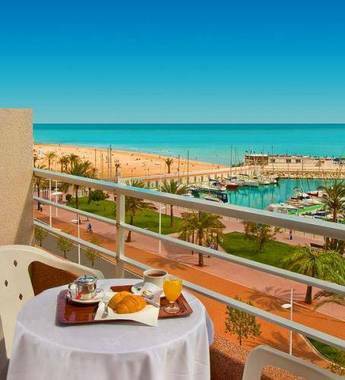 San Luis offers views of Gandia’s marina from its setting 50 metres from the beach. This hotel features an outdoor swimming pool and rooms with terraces and views of the sea, swimming pool or marina.